At the Democratic National Convention signs read No TPP, a concert is traveling the U.S. called Rock Against the TPP, and even Donald Trump wants to stop the TPP. Unlike Donald Trump, most of us are not protectionists looking out only for U.S. corporate interests and the rich 1 percent, but rather embrace global trade when it is through fair trade agreements and policies that protect farmers, workers, and consumers around the world as well as protects our planet. Those of us working in the fair trade movement, and in social justice have been working on fighting unjust trade agreements for years, and it is gaining momentum in the mainstream. Community coming together to stop unjust trade deals. So what is the TPP? The TPP is the Trans-Pacific Partnership, a massive trade agreement between 12 countries — the United States, Japan, Malaysia, Vietnam, Singapore, Brunei, Australia, New Zealand, Canada, Mexico, Chile and Peru — that has been coined by anti-TPP activists as NAFTA on steroids. NAFTA (North American Free Trade Agreement) was a trade agreement signed in 1994 by the United States, Mexico and Canada that displaced over 2 million farmers and agricultural workers in Mexico. Family farmers in the United States and Canada also struggled and lost income while large-scale farmers and agricultural corporations thrived. The TPP is expected to have similar effects on a much larger scale. The government and mainstream media have reported that the TPP will benefit the agriculture sector. But what they are not saying is that the sector of the agriculture system that will benefit is the industrial system that harms people and the planet. The United States is highly reliant on industrial agriculture, which means those 12 countries going into the agreement will be pitting their small-scale farmers against our large-scale farming practices. This will force small-scale farmers out of business and off their lands strengthening the industrial agricultural machine. The industrial food system drives climate change; we cannot break our reliance on industrial food without first breaking our reliance on unjust free trade agreements. So it is not the organic, regenerative, biodiverse farmer who provides your CSA or morning coffee who will benefit. 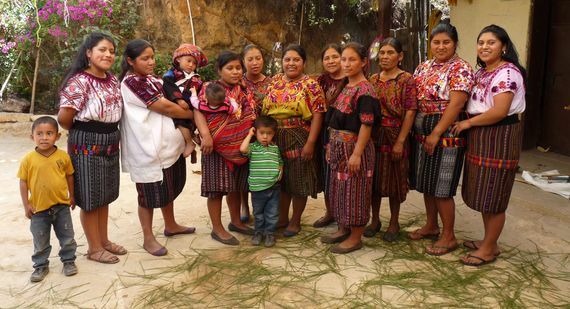 Small-scale farmers around the world like these Maya women are most impacted by unjust free trade agreements. TPP is promoted as good for the economy and business. But studies show that the TPP would mean a pay cut for 90 percent of U.S. workers. We know that many small businesses oppose it. These businesses, including small food businesses, craft coffee roasters, and fair trade apparel and craft businesses understand that the TPP will make it hard to compete based on ethical business practices. It will drive the race to the bottom. These trade agreements do not allow for countries to protect their citizens and the environment because the agreements allow corporations to sue governments for perceived loss of profits. For example, early in 2015, the TransCanada Corporation initiated a $15 billion dollar lawsuit, under a provision of NAFTA, against the United States after President Obama blocked the Keystone XL pipeline. Large companies will be able to sue governments over imposed rules intended to protect small-scale farmers, workers or the environment and therefore will be able to undermine local governments, food sovereignty, and local businesses. And small businesses can’t afford to sue. The trade provisions of the TPP are binding while the provisions of the COP21 climate agreement are not. That means that trade rules will always trump climate goals. There will be no room to promote the regenerative, organic, fair agriculture we need. TPP does not promote sustainable agriculture. Doctors Without Borders opposes the TPP. Why? Because access to less expensive, generic medication will be threatened as drug companies holding patents are given more rights. This will harm impoverished communities in the global south who already struggle for access to medication. The TPP will require countries to accept food that meets only the lowest safety standards of the collective participating countries. The agreement also limits the authority of governments to restrict permits to extract and export liquid natural gas to participating countries, which could lead to an increase in fracking. 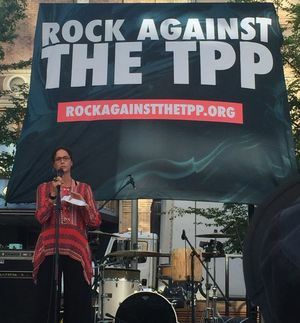 For all of these reasons, people around the world are uniting to stop the TPP. 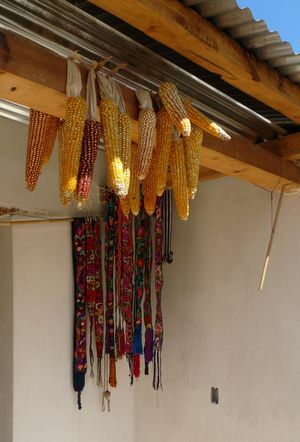 It is especially important for those of us advocating for a sustainable food and agriculture system to stand up for small-scale farmers and small and mid-sized businesses and retailers. The negative impact of TPP on the entire supply chain will be very real. In the U.S., we ask that everyone write to both your Senators and Representative asking them not to vote on the TPP during the “lame duck” session. This is the time after the elections when everyone is so focused on the transition period (November-January) that it is easier to slip through unpopular votes such as the TPP that would otherwise not pass.